NEGAME is a lottery platform that wants to take the power away from centralized means of lottery to decentralized automated, non-rigging and commission free lottery platform. This project makes the lottery non-profit and autonomous, capable of continuous operation and achieving full transparency via Ethereum blockchain. It will allocate all funds down to the last penny, by using a clear algorithm which is written into the lottery’s smart contract. NeoGame’s mission is to transform the global gambling market into a non-profit and no-host model create a space where nobody makes money on games and nobody is interested to chase problem gamers. 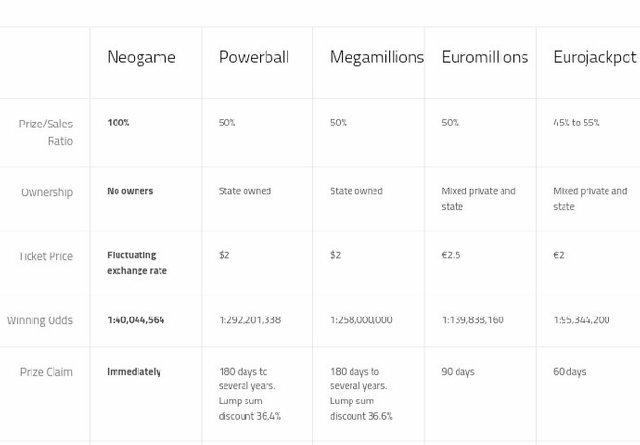 NeoGame is a new lottery game that does not serve any beneficiaries: it has a zero house edge and no one will be able to access the funds: the only way to get them is to guess the winning lottery numbers. With NeoGame, you can organize lottery games with friends and spin your wheel or whatever way you want the ticket of winner to be picked and enjoy the game. This will be a game platform, which affords users to play for long amongst them and enjoy instead of like accumulating win points; you win in token which is tradable. NEOGAME is set to be the first platform with no monitoring, or people involved or intermediary and is centered on the players having a fun day and winning big. Based on Ethereum smart contracts, the lottery will exist as long as blockchain exists. 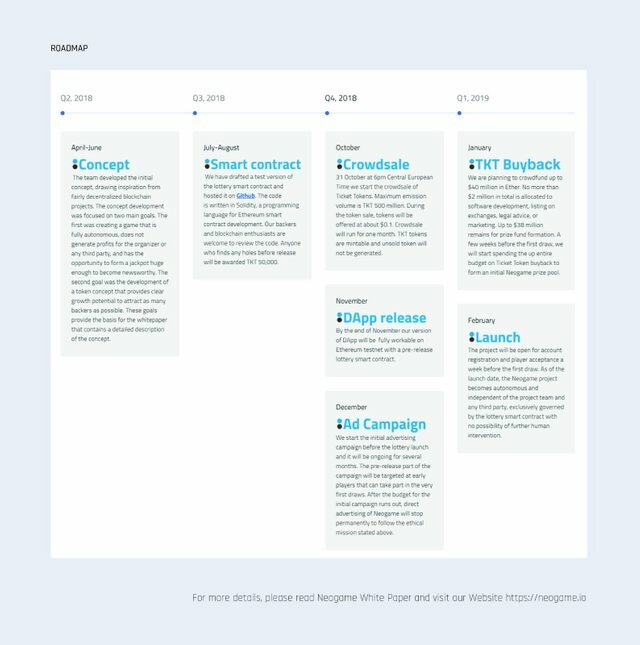 It doesn’t need centralized management, it will just gather funds from tickets sold and distribute them all among winners according to a fair and clear algorithm. NeoGame will not serve any beneficiaries: nobody has access to its funds other than by correctly guessing WINNING lottery numbers. No lottery in the world offers such conditions for players as NeoGame. It gives all raised funds to winners, while other lotteries usually leave 50% of funds for themselves and their projects. Moreover it’s up to 7 times more likely to win a jackpot with NeoGame than with most popular lotteries. It is fully anonymous and winners can take their prizes immediately. NeoGame will function using Ticket Tokens (TKT) as both lottery tickets and prize fund currency. The supply is limited to 500 million tokens, and we will work to increase their value. When tokens value grows, the prize fund grows proportionally. If token value increases significantly, the jackpot size can be enormous. The Ticket Tokens (TKT) owner purchases a lottery ticket, selects a combination of numbers using a decentralized application, and sends the tokens to the Smart Lottery contract. Ticket Tokens (TKT) NeoGame will be represented on stock exchanges and their value is expected to increase due to increased demand. Ticket Tokens (TKT) are standard ERC20, compatible with any purse that supports the Ethereum tokens. This provides the project with continuity and infinity on the Ethereum chain. Standard lotteries have an unlimited number of tickets. But in NeoGame is limited the number of Tokens. Accordingly, it will be impossible to purchase a coupon, if there are no free tokens for its acquisition. All this will cause an increase in demand and prices for it, as soon as information appears that someone has won the Jackpot. Weekly rallies and Mandatory Jackpot payouts are another “plus” of the project, which is strikingly different from the usual lotteries. NeoGame is a complete and independent mechanism capable of accepting bets, drawing rallies and paying out prize tokens according to the algorithm. The system has no interested in profit developers and the algorithm for selecting random numbers does not depend on the team. TKT supply is limited to 500 million units and no further tokens can be issued according to the smart contract terms. If the game gains popularity, the token exchange rate should increase, as happens every time on any market when increased demand meets limited supply. The token sale hard cap is about $40M in Ether. Only up to $2M are allocated to software development, listing on exchanges, marketing and legal advice. The remaining funds (up to $38M) will be spent on buyback of TKT tokens to form the initial prize fund. The buyback will be done at the exchange rate and will not stop until the full amount is spent. This should make a great positive impact on the tokens’ exchange rate. Ticket Tokens values should predictably go up and down. They will probably tend to grow between jackpot wins as the prize fund grows and fewer tokens are available in free circulation. And they will likely to decrease in value after someone wins a jackpot and sells the entire prize to other currencies.